The bank pen security was fine. The major risk with a bank pen is not that someone will intentionally steal it, but that someone will unintentionally pocket it and walk off with it. So the chain makes that more difficult. At the same time, the pen will run out of ink and need to be replaced. The breakover clasp allows the pen to be replaced simply when needed. Before I retired I was sick of having people walk off with my scissors so I tied them to my desk with a string. I never lost those scissors. It’s not any different from a pad lock, it’s just there to keep honest people honest. Any of the cables used by stores can be easily cut if someone really wants whatever is being held down by them. TSC used to have bolt cutters locked up. With a cable running through the handle. It would have been very easy to cut the cable with one of the ten sets of bolt cutter in the rack! I often wonder if the level of common sense we have is directly proportionate to our dependence on others to think for us. I think that’s the observance of the emergence of the Eloi. We’ll be eating them soon if HG Wells’ “Time Machine” has any relevance. Really, it’s one of those keeping honest people honest things. It’s just a few seconds more that it would take someone to steal that and hopefully, all the noise might bring a salesman over to assist with the demo or answer any questions. And don’t knock the Craftsman RAID. I have that thing and it is awesome. I’ve driven some major size lag bolts with it and for the price, it can’t be beat. A few seconds of deterrent is all that’s needed to stop most thieves who rely on opportunity. IE: If your front lawn has no fence line demarcated, people will transgress without thinking, but place a mere wire-hoop fence across and most will honor it. As for the Crafstman RA drill – It’s available often for less than half the price of a Bosch and performs almost as well. It’s a best value for a home owner for sure. Oh yeah. I picked up the RAID on sale for $59.99, plus $10 in instant rewards points, and a free 12v drill with the purchase. You can’t beat that with a stick. I just looked up the tool, because of the positive comments about it here. Sears.com it’s 69.99 (regular 99.99). Amazon.com 59.99. Sears.ca 159.99 cdn, at current exchange rates that’d be 159.82 USD. So A) I’m not buying one anytime soon and B) No wonder Sears Canada is tanking despite Sears returning to profitability in the US. To add to the cluelessness and amusement, I see on the Sears Canada site, when shopping for tools you can shop by colour. I looked into this a while back. Half the tools sold in the US are not available in Canada simply because it’s not worth the R&D to redesign them to CSA standards … and some Canadian standards are quite goofy. I get around this by ordering to a PO box in the States and having them shipped over the border. And yes, Craftsman C3 tools can be found in Red, Grey, and Black. They are all exactly the same but for color; the difference is the warranty. Not one single worker or manager at Sears could tell me why in hell’s name they were different!! I had to phone head office. Red = “Pro”, which can also be a part of a set but which actually means it carries a longer warranty, and goes directly against their hand tool line where black is “pro” and red is not. It also causes confusion with their 20V L-ion line which is red and NOT pro. If you’ve ever wondered why Sears is losing market share in a niche they’ve owned for decades, wonder no more. Hmmm…not really. All 19.2v C3 tools are black regardless of whether you buy a kit or the tool individually. All of the 12v nextec tools are grey, also regardless of whether you buy individually or in a kit. The only other grey tool that I can think of is the 18v evolv drill driver which is a stand alone line and is grey with lime accents and the opening price point corded drill. Sears still makes red power tools, although the bulk of the power professional line was discontinued last year. All the power tools have a 1 year warranty regardless of color. All the colors really do is signify the traditional Sears “good, better, best” tier structure which they’ve used for years with grey being the good line, black the better line, and red the best line. Also with the hand tool line, the professional models are black and gold, the standard models are black and red. Same warranty, higher specs on the professional items. Don’t know who you talked to at the “head office” but almost none of what you said was correct. The only thing red in the C3 line-up is the L-ion batteries & chargers. They are red & black. The Craftsman 20v “professional” line of tools are/were red, but they never took off. Too expensive. No. They are are/were not. Period. I have in my shop two identical 19.2V C3 drills, one grey and one black. When I bought the black one, I chose not to buy the red set that also included an identical spec 19.2V drill. I have most of the C3 accessories, know exactly what they are, and am not confused with the Nexus line, the now defunct 20v pro line, or the 14v line. 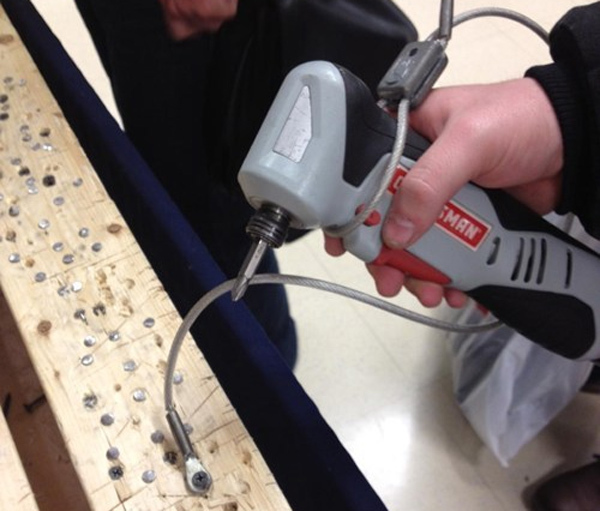 I have returned a number of power and hand tools over the years and am well versed on the vagaries of the Sears warranties as applied to their ever changing product lines. Sadly, you are just ignorant, just like everyone else. Actually, I work for Sears in the tool department. I stock the shelves. I see and sell the items everyday. The current line of 19.2v tools are black, all 35 of the individual add on tools and all 12 of the combo kits, and have been for at least 5 years since the last major shakeup of the offerings. The 17310 li-ion drill/driver is about as close to red as it gets due to the red accents signifying that it is a li-ion battery and not a Ni-Cad. Your grey 19.2v drill is probably not C3 as it’s color scheme predates the C3 line’s creation. Your grey 19.2v drill is from the EX line which lasted only about a year, maybe two, before it was retooled into the C3 line. Same tools, different color and marketing. The red drill that you linked is not a Sears product, it is a Sears Canada product. Despite common misconceptions and partial ownership, they are not the same company. Domestic US C3 products are all black. The one you linked is from Sears Canada’s MD line which is compatible with Sears Domestic’s C3 line as far as connecting to the battery terminals but are not the same thing. I’d be happy to give my rep at TTI, who makes the majority of Craftsman power tools, a call and get him to fax over a list of model numbers and colors. And, as an aside, accusations of ignorance towards a remote internet personality sans empirical evidence generally betrays a clinical predisposition towards intellectual arrogance, narcissism, insecurity, and an inferiority complex. In other words, if you feel “everyone else” is ignorant, it means you probably missed something. I’d say the cable is there just to keep people from doing anything else with it, like waving it around or drilling into one of their friends. As far as I’ve seen, the stuff at Sears with security tags and cables has them to make it seem like they are really high end stuff. Those particular tools are nearly worthless and were selling online for over 75% off not long ago. Even then, they weren’t worth it. With Sears moving everything Craftsman, including all the hand tools, to China, the only thing I’ll be buying in a Sears store is the clearance USA tools that are left.